Spun Gold-- IOC Orders Investigation of Chi-Com Gymnasts! Spun Gold– IOC Orders Investigation of Chi-Com Gymnasts! 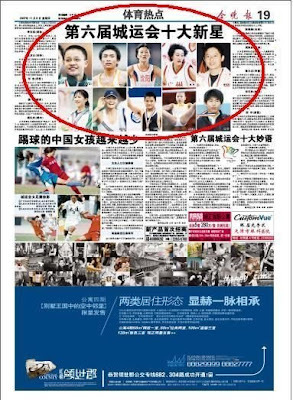 There were several articles published on He in the Chinese press this past year that said she was too young. The Chinese tried to scrub them away… But couldn’t. The International Olympic Committee has ordered an investigation into the age of Chinese gymnast He Kexin, The Times of London reports. Faced with almost insurmountable evidence which suggests that He is two years younger than the birth date listed on her Chinese passport, the IOC has launched an inquiry that could result in the stripping of He’s gold medals. This news comes on the heels of another Times report that details the findings of a New York computer security expert who found official Chinese documents that list He’s age as 14 years and 220 days. Mike Walker used a Chinese search engine’s cache feature to find He’s actual date of birth on spreadsheets from a Chinese government website. The spreadsheets were taken down off the site recently and He’s name had been removed. Assuming the IOC is committed to a real investigation and not some dog and pony show, the revelation that the Chinese government covered up the ages of gymnasts could end up being the defining moment of these Games for the host country. Officials wanted the Olympics to be a coming out party for a new China. But while the Games have been a huge success, there is a legitimate possibility that China’s legacy from Beijing ’08 will be that of a massive government cover-up, not the magical Opening Ceremony or the transformation of Beijing or anything else positive. The Chinese tried to scrub away the truth but Google cache wouldn’t let them. MORE On the Chinese Cheats! !… Additional Documents Prove Gymnasts Were Too Young!